Initial Reaction of Book in One Word: Cute! 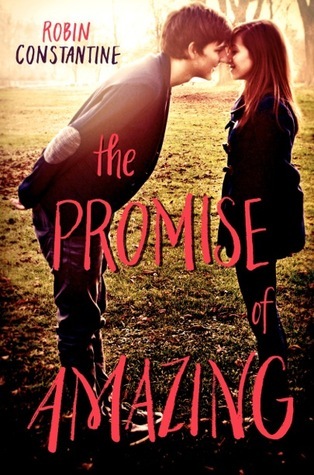 I won't lie; I went into The Promise of Amazing hoping for something promising and amazing. I thought it might be super cute like Anna and the French Kiss or The Distance Between Us. While it wasn't not cute, and it wasn't bad, this book fell short of amazing and hit a little higher than okay. The Promise of Amazing is told from the alternating POVs of Wren and Grayson. Wren's quiet, doesn't know what she wants to do with her life, and is not quite over her "hump-and-dump" from the summer. Grayson's an expelled private school boy with a not-so-good past, a girl user, and he's not really going anywhere. But when Wren performs the Heimlich on Grayson at his cousin's wedding at the Camelot (Wren's family owns the place), sparks fly, and the two have an instant connection. From there, they have their ups and downs. Don't get me wrong--I did like The Promise of Amazing, more so than not. (It's just one of those books that's hard to put into words.) It didn't take long for me to get into it--and I was really into it several times--and many scenes were fantastic. And I definitely had some feels. The writing wasn't bad and it had some fun and wit to it; I wouldn't say no to reading something by Constantine in the future. Also, this went a bit deeper than a cute book (though I'd still classify it as that), especially with Grayson. It had a slight air of mystery to it (and him), and I liked that. Based on the synopsis, the book really isn't what I had expected at all. In the end, this book had a nice romance and interesting plot, with a few things mixed between. It didn't have any glaring issues, but there was that unnameable something missing. However, I did like this book. (I don't feel much now, but I almost liked it a lot while reading it...I think? Like I said, I don't remember.) If you're looking for a quick, cute contemporary that's basically a feel-good (a pretty light read, I'd say), this is one of those books. But while The Promise of Amazing sounds promising (and looks it with that adorable cover), it falls short of amazing (for me, at least). Did I like it? Yep! Would I reread it? Possibly. Would I purchase it? Maybe--I wouldn't mind having a light, "safe" book on my shelves. Who would I recommend it to? Contemporary lovers, especially those who like the cute and fluffy (and maybe a bit more). Review twins! I didn't hate this book but I don't really have any feelings about it. I was underwhelmed by the bleh.